The most important aspect of any business is understanding and communication. 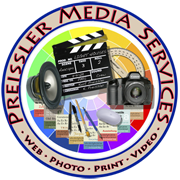 Preissler Media Services is geared towards all indivdual and business entities. We are excellent listeners and are extremely attentive to detail. Our job is to communicate your story visually and clear. We measure success by how well we advance your marketing objectives. Your message not o nly should work, it has to work. Everyday, we are inundated with an infinate amount of media information, your information must be differentiated and your message must resonate. We design for aethetics and utility. Design can be too simple and complex we understand the proper balance and the approach. Below are some sample prices for various design projects. Final price is determined by the complexity of the work needed and time it takes to complete. NOTE: All pricing listed on this page does not include printing as that is determined by the nature of your project and quantity needed. Pricing is for design only and is based on a hourly rate of $75.00 per hour. Consider electronic template or a database, otherwise, quoted on request.